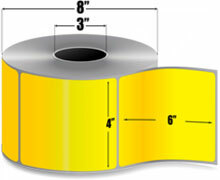 Zebra Z-Perform 2000T Floodcoated - 4" x 6" Thermal transfer Floodcoated Yellow paper label. 1,000 labels/roll. 4 roll case. The Zebra Z-Perform 2000T is a white, coated paper label offering excellent print quality for thermal transfer printing up to 8 ips. Permanent acrylic adhesive offers high initial tack and adhesion to corrugated surfaces. Recommended for a wide variety of applications, such as box, compliance, work-in-process and indirect food labeling. The Zebra 10006208-1 is also known as ZEB-100062081-CASE	or 100062081	.